Let me talk for a few minutes, and then y’all help me with this one. Those of you who are reading this online are welcome to comment, of course. We have before us what is probably Jesus’ most popular parable. 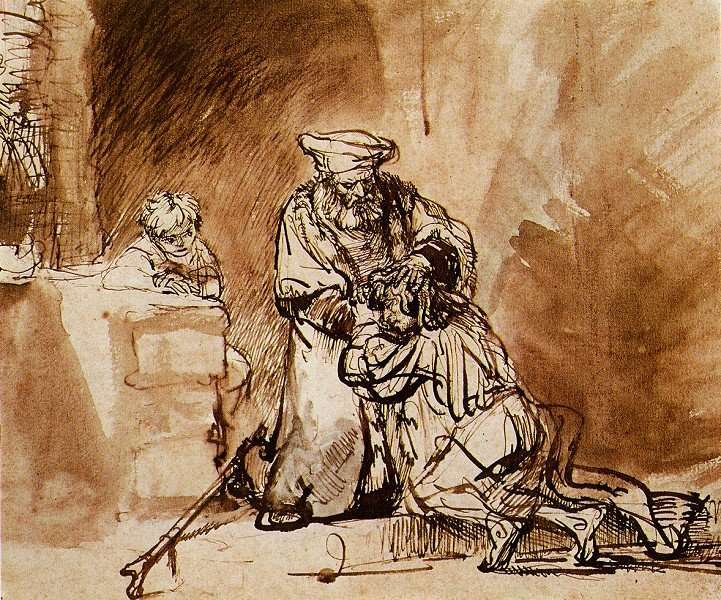 The parable of the prodigal son, a young man we might today describe as a “wild child,” is a rich metaphor of God’s grace, a story we could unpack section by section for weeks. It also is a good follow-up to last week’s Bible text and sermon, which reminded us of the need for vigilance in the face of sin. This week, we’re shown how God responds when we step away from sin and its sidekick, death. Any of you tried that? It’s fun until the money runs out. The money ran out. The snot-nosed little punk was left with not so much as a hankie to his name, and ended up working at the nastiest job a Jew could perform, the feeding of pigs. The reality of the pig sty was sobering; the NRSV says he “came to himself.” Hank Williams had not yet written “I Saw the Light,” but the filthy, mud-caked—wait, is that mud?—young man must have been humming a Jewish version of it as he headed home. On the way, the rehearsal began. He had to let his father know he was sorry; he had to show proper repentance. “Father, I have sinned against heaven and before you; I am no longer worthy to be called your son; treat me like one of your hired hands.” I’m sure he practiced that act of repentance not once, but dozens of times, on the long walk home. God—excuse me, I mean, Dad—saw him coming from far away. That means God—whoops, there I go again—that means Dad was scanning the horizon day after day, seeking his beloved child’s return. Are you seeing this: The rude, filthy child finally turned toward home, and Dad ran to him. The son tried to get the words of repentance out. He started them, but he never made it as far as his offer to work as a hired hand. Dad was already calling for robe, ring, sandals and banquet, presumably all to be preceded by a bath. A celebration was in order! There’s more to the story, of course. There’s an older brother, filled with anger and jealousy when he sees the father’s ridiculously gracious response. Today we’ll just acknowledge that such people are out there. Don’t be one, and don’t let them bring you down. Let’s instead focus on this repentance interrupted, this grace that tackles us and wraps us in love before we can even finish our “I’m sorry.” We are all deserving of death. We’ve all been snot-nosed punks who at some point wanted our own way rather than God’s way. But God grabs us, God restores us. All we have to do is head for home. When did you receive the ring, robe and sandals? What was your banquet like? And if you’ve not yet gotten them, do you want them? Turn toward the risen Christ, and see him running toward you.